A boutique website design studio that prides itself on a personal and effective approach to every project. Today was the first real day of riding. 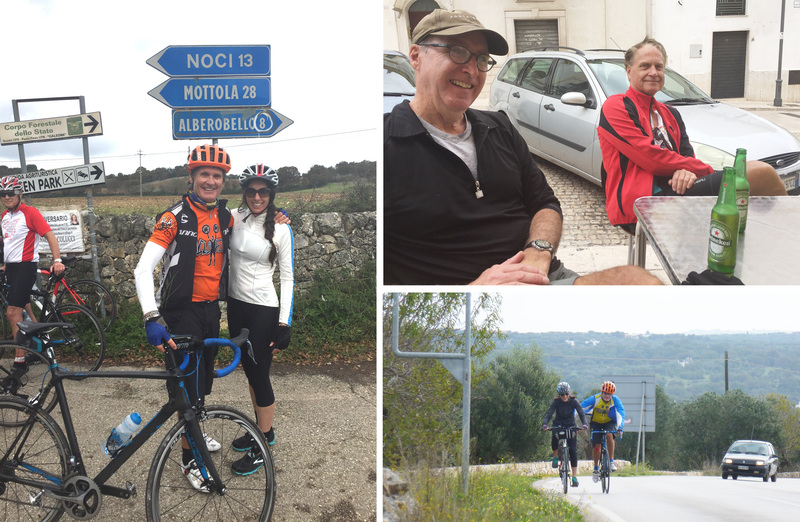 We broke the ride into 2 segments with a break for a cappuccino, lunch and tour of the town of Alberobello. 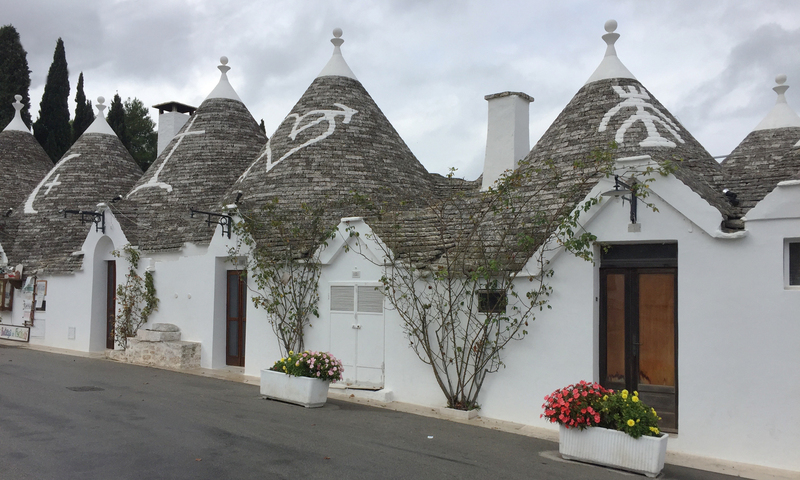 Our charismatic guide Nemo shared his knowledge of his beloved city, the first known Trulli city dating back to the 14th century. 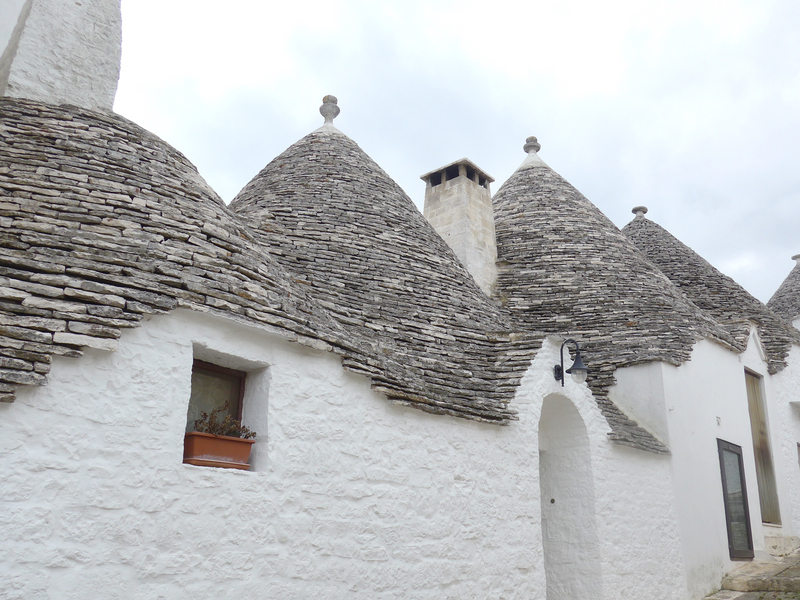 All Trullis were constructed with white limestone and without mortar so that they could quickly be dismantled in order to evade taxes. Day one we did a short 12 mile ride to get used to our bikes. We road to the coolest little local coffee/bar shop. They had the most amazing ceramics made from local artists. 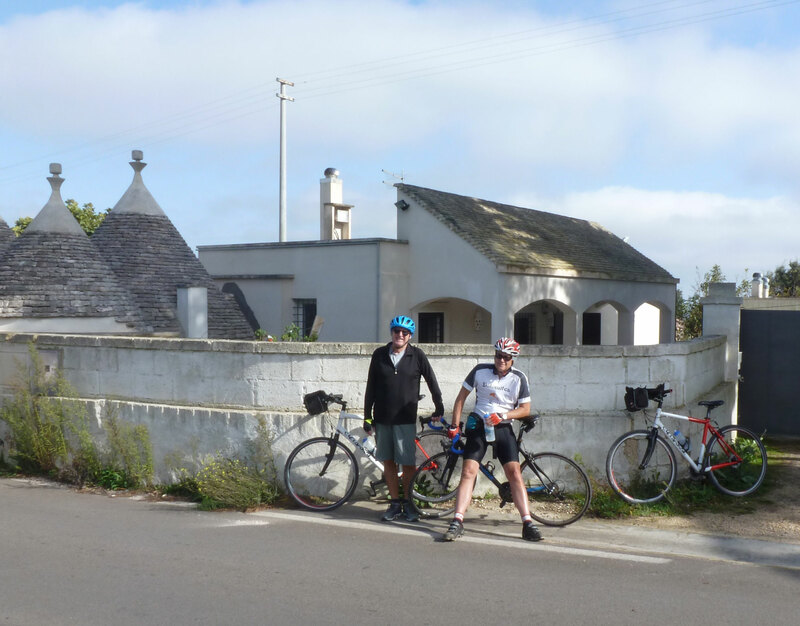 After breakfast at the Maseria we rode through the trulli filled coutryside to the town of Palagianello. 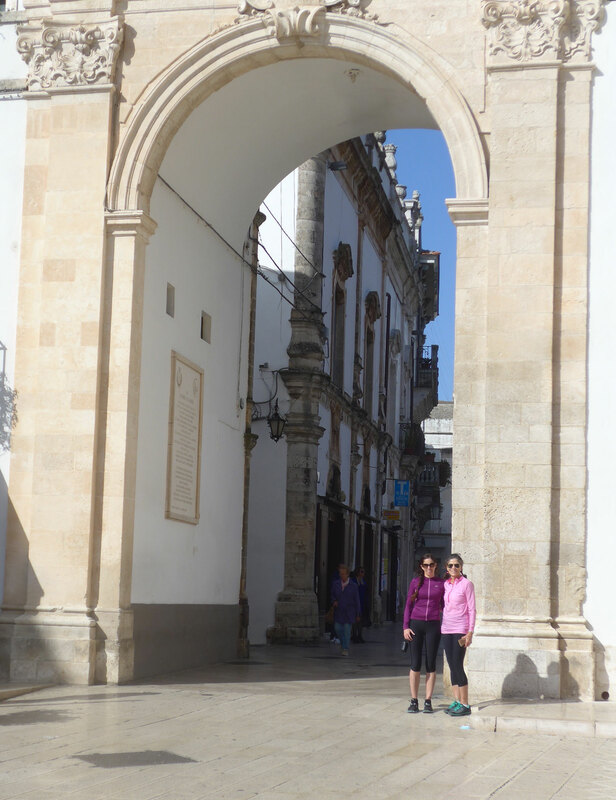 The town was founded in 1102. We enjoyed a yummy lunch at a funny cafe in town (my Moms Italian was very helpful). 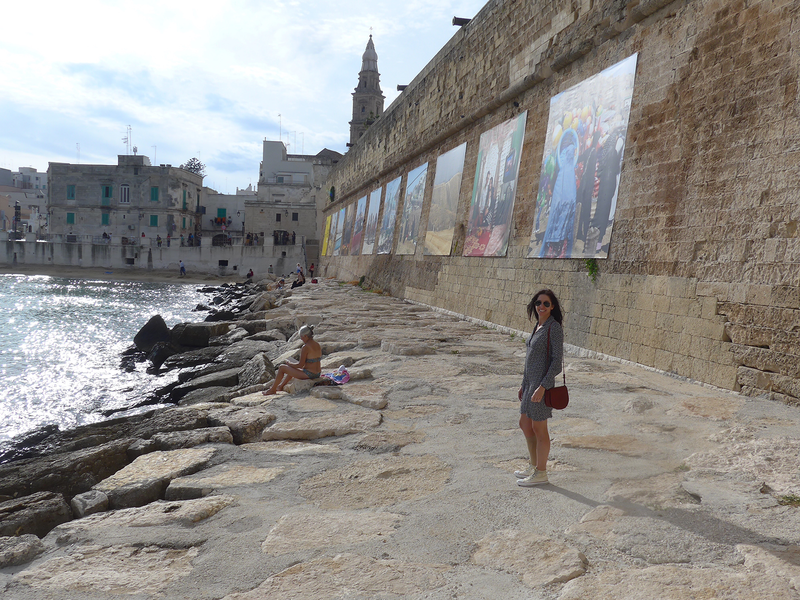 After lunch we had a 45 minute drive to the ancient cave town of Matera. 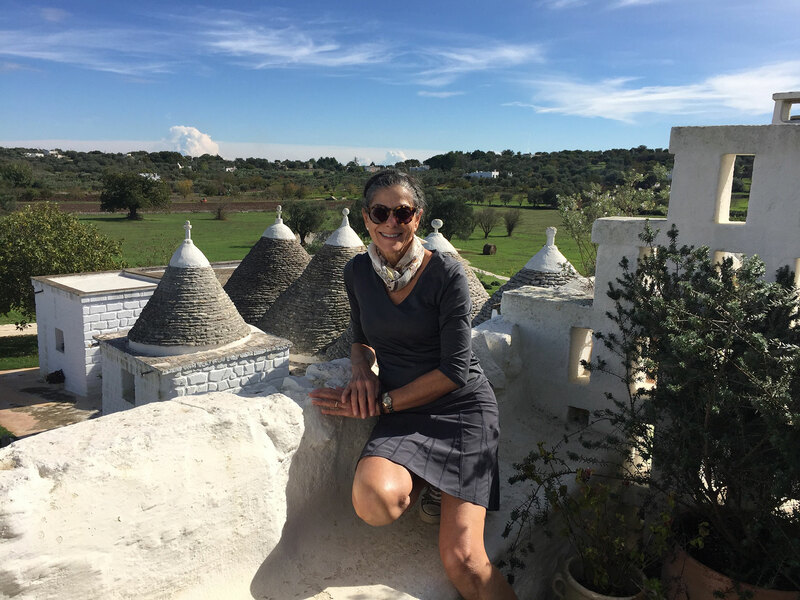 We met our fabulous guide for sweats and cappuccinos before entering the historical center know as Sassi. 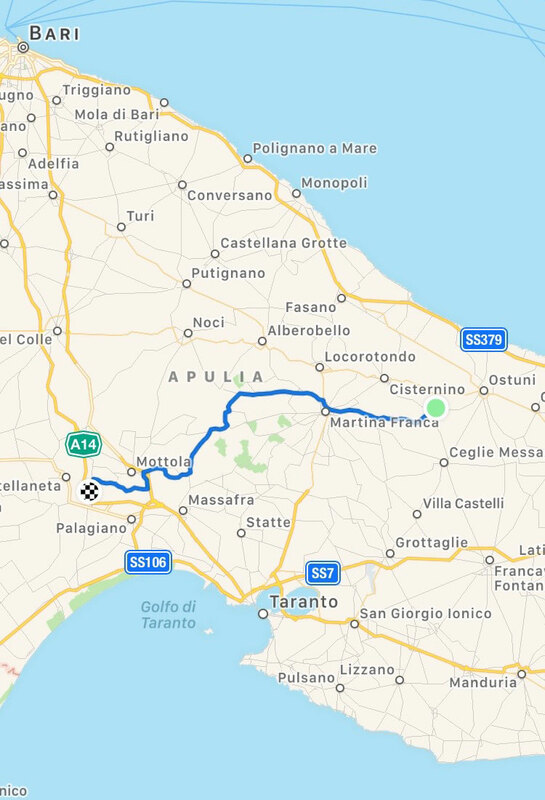 In the 3rd Century BC the city was allegedly founded by the Romans. The city was dug into the rocks. In 1993 was declared “World Heritage” by UNESCO. 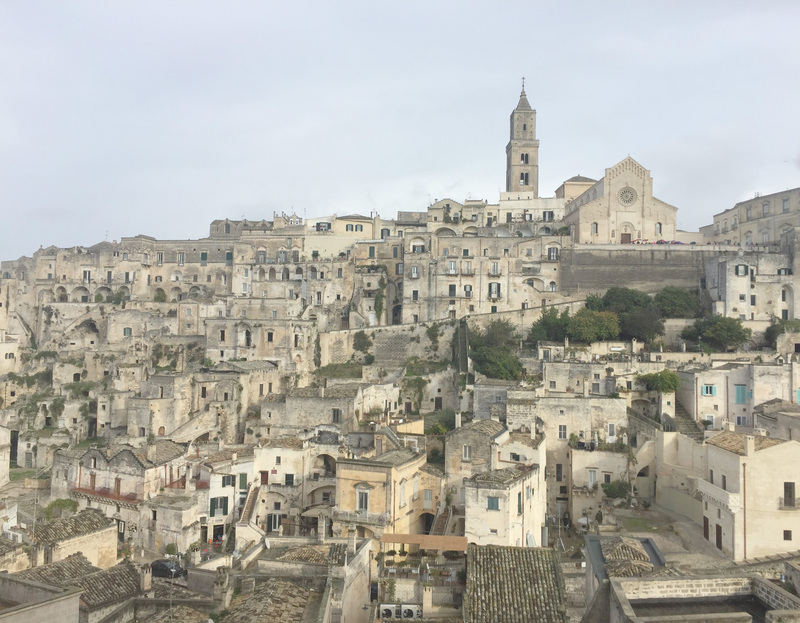 The best way to see Matera is to wonder around the winding streets, we laughed that this never would be allowed in the US, too many obstacles! 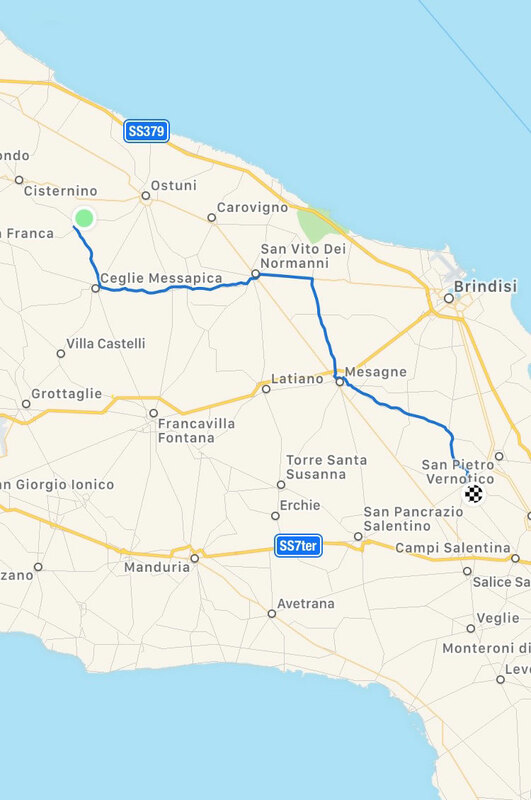 It was a 2 hour drive back to the Masseria. 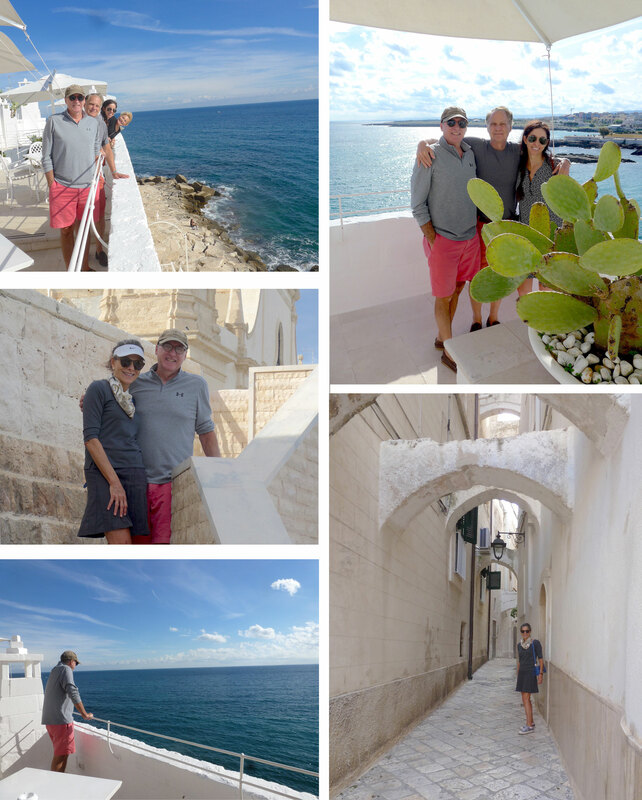 For dinner we went into the old town of Ostuni (10 minute drive), which is known as the white city. 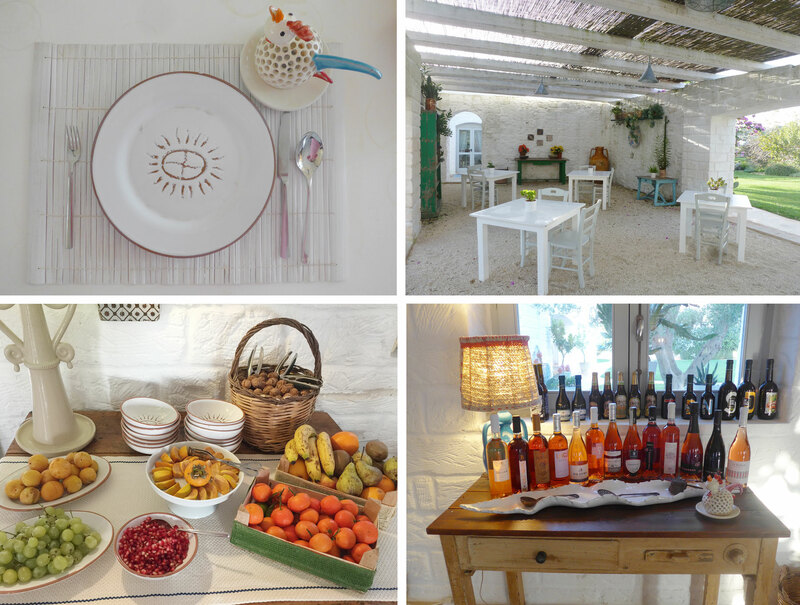 We ate at the charming family restaurant Taverna della Gelosia. It is a popular local spot that was chalk-a-block full of the owners collection of shadow box framed religious relics. 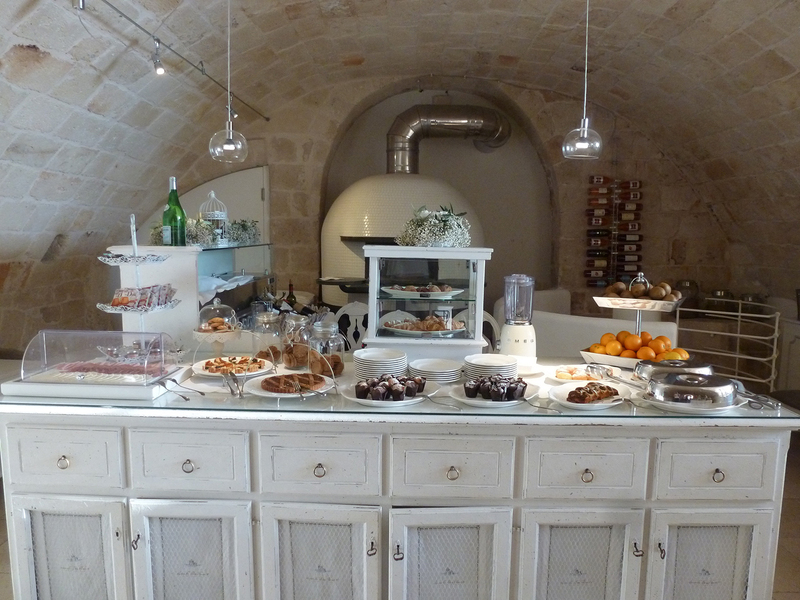 As with all of Puglia they are known for their appetizers. Try the pasta nera, it is a medieval recipe. 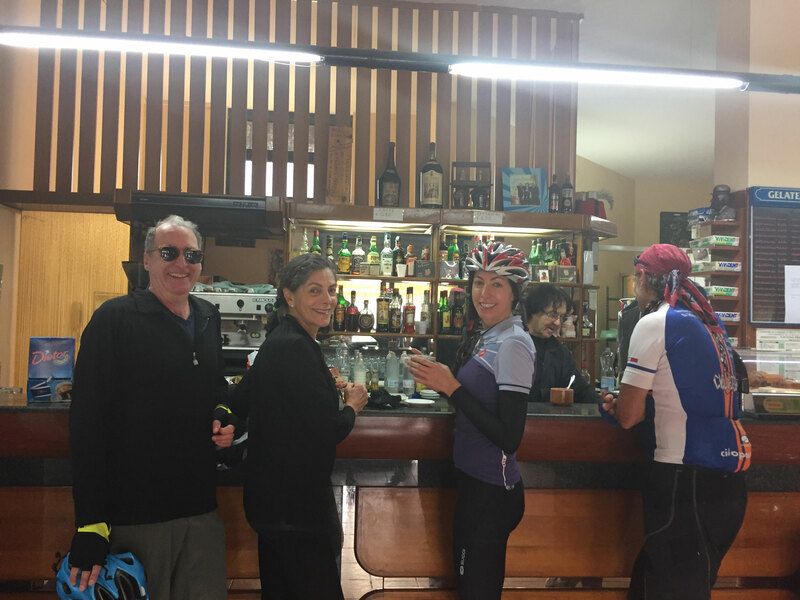 Today we rode to the Li Veli winery with a stop at Luigino D’Errico in Mesagne for cappucino made by Luigino himself. 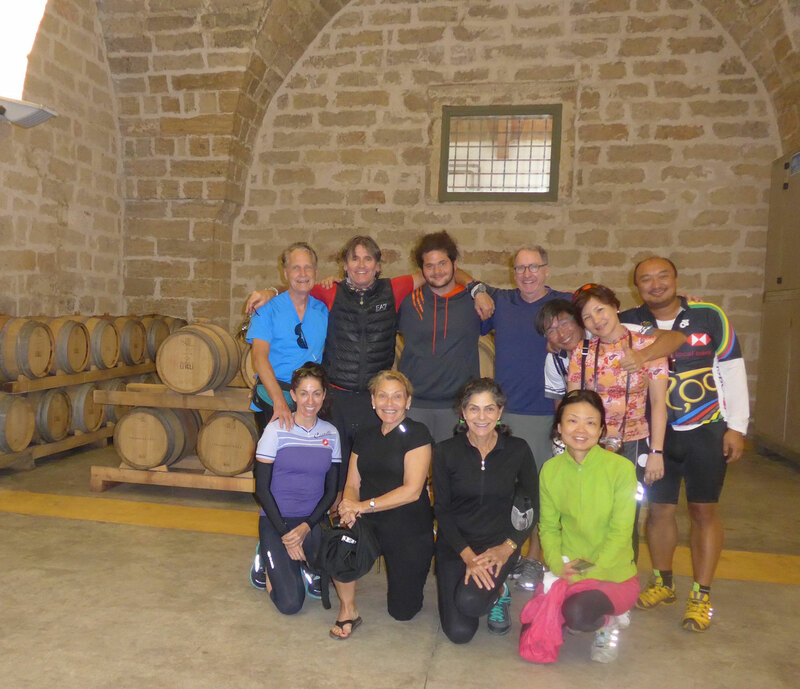 From there we rode to the beautiful winnery Li Veli in the Salento area. 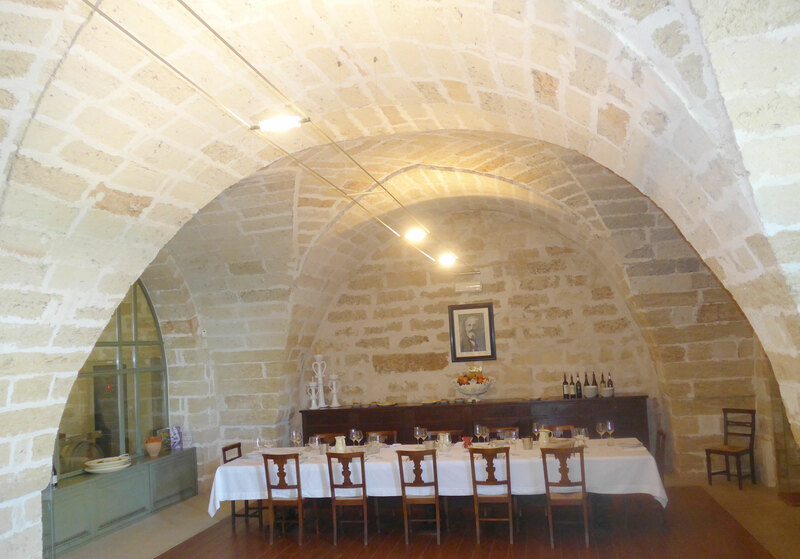 We enjoyed a beautiful private lunch with wine tasting followed by a tour of the winery. 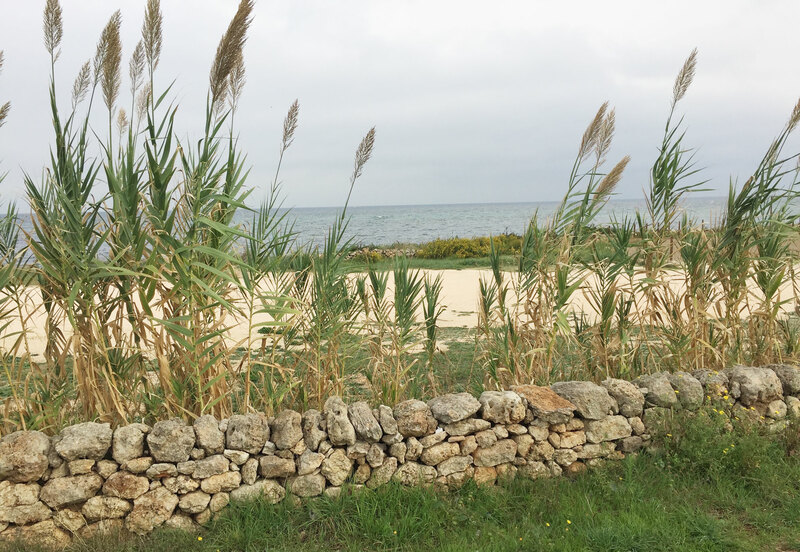 For dinner we went to Al Solito Posto. This is unlike any pizza place I have ever been to. Loved the contempory fun interior. Again it was hard not to fill up on the unbelievable appetizers. 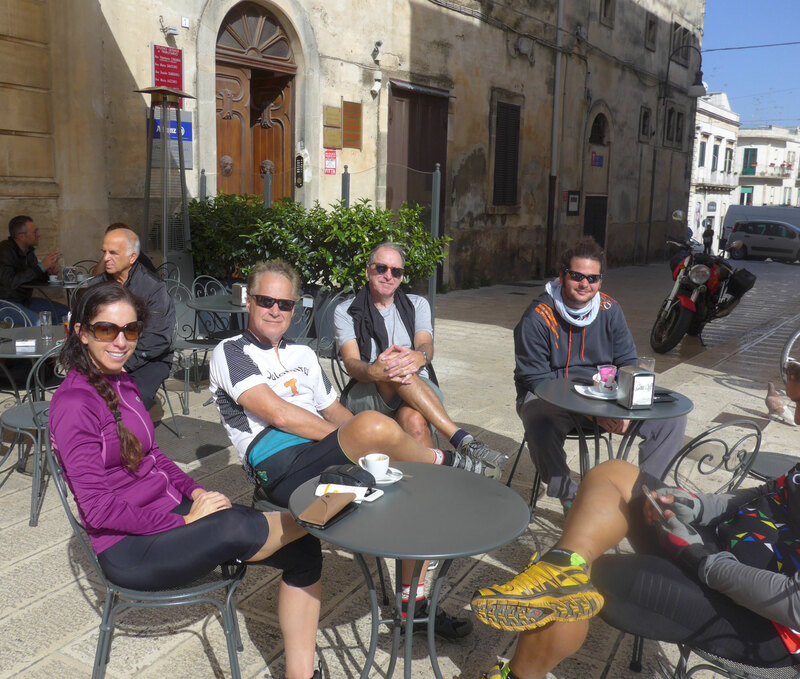 Today we stopped for cappuccinos in the beautiful historic town of Martina Franca. 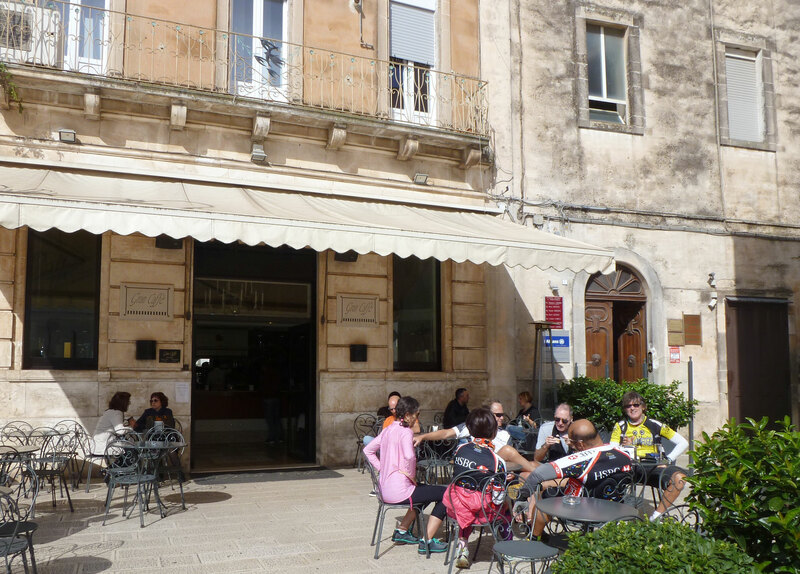 The Gran Café, is located directly outside of the city gates. 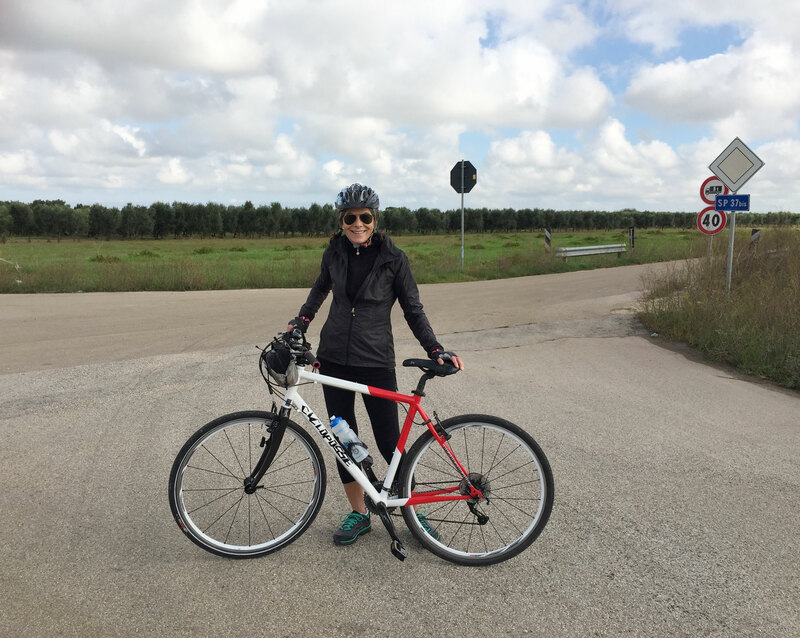 We had time for a very quick walk around of the city and then back in the saddle to ride to the Family Owned Trisole Olive farm. 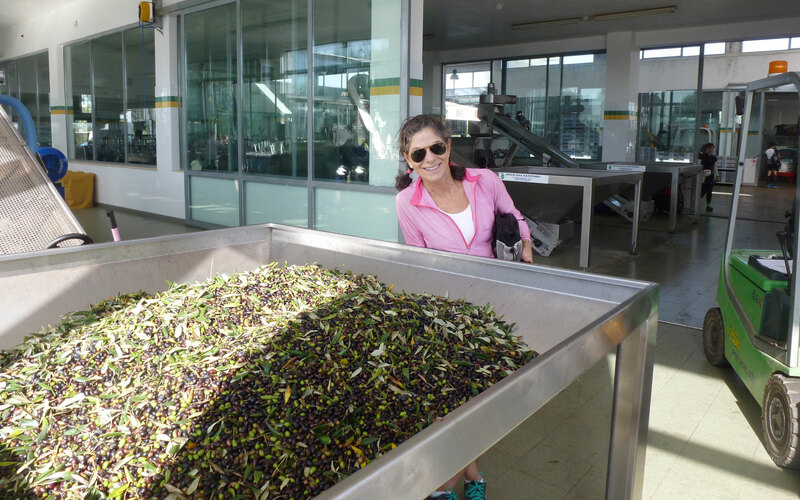 We were so lucky to be at the olive farm during harvest. 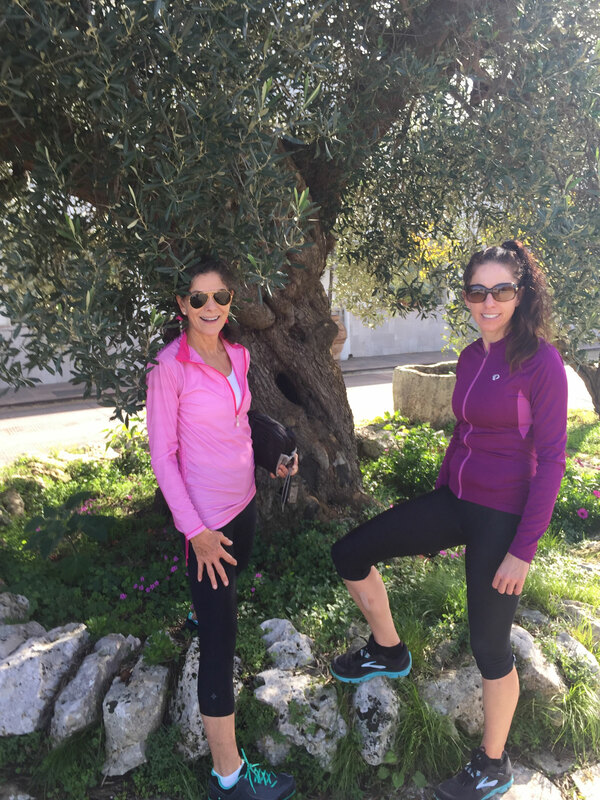 Outside the farm there was an olive tree that is over 1000 years old. Walking into the harvest area the smell was overwhelmingly delicious. 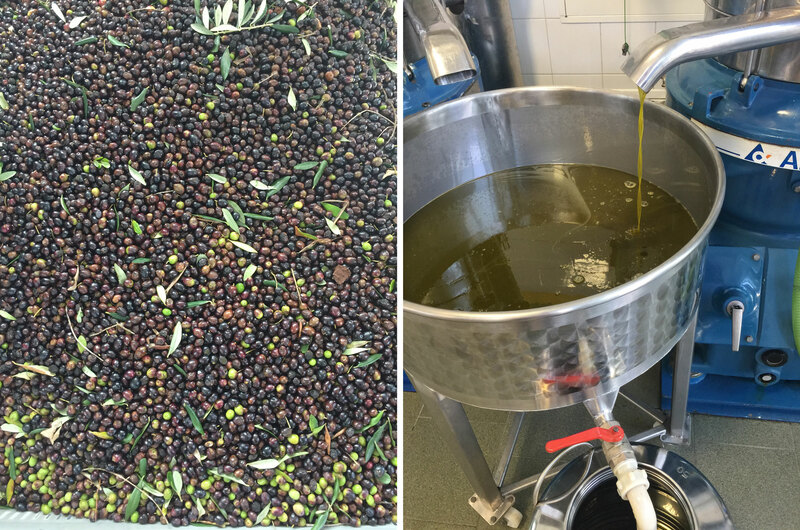 We saw two processes of making olive oil. 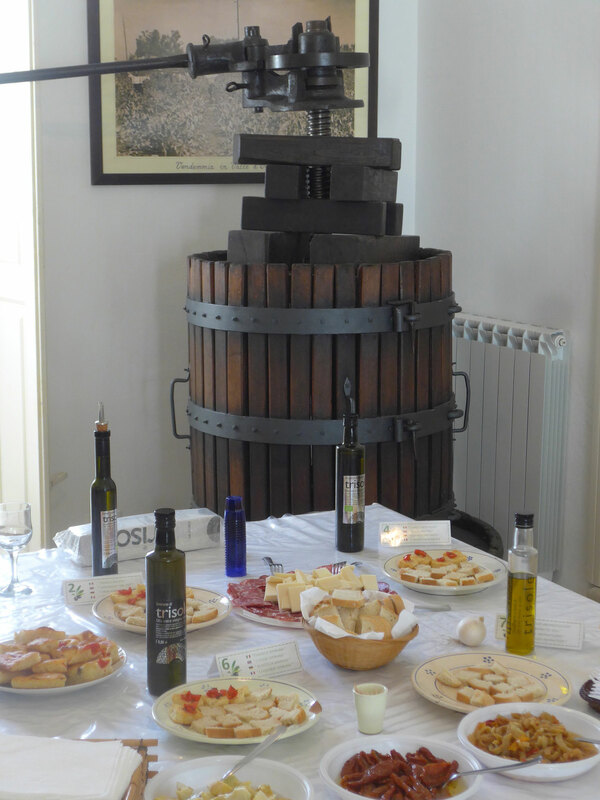 The traditional process with old stone that grind the pit and the olive which produces a more bitter and strong olive oil. And the new way which the pit is removed from the olive and produces a more delicate taste. 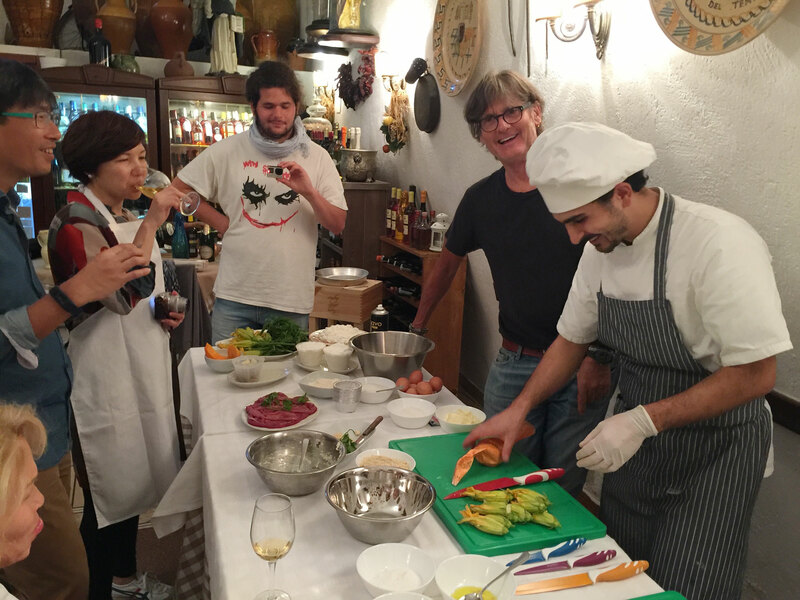 For dinner we went into Ostuni for cooking class. 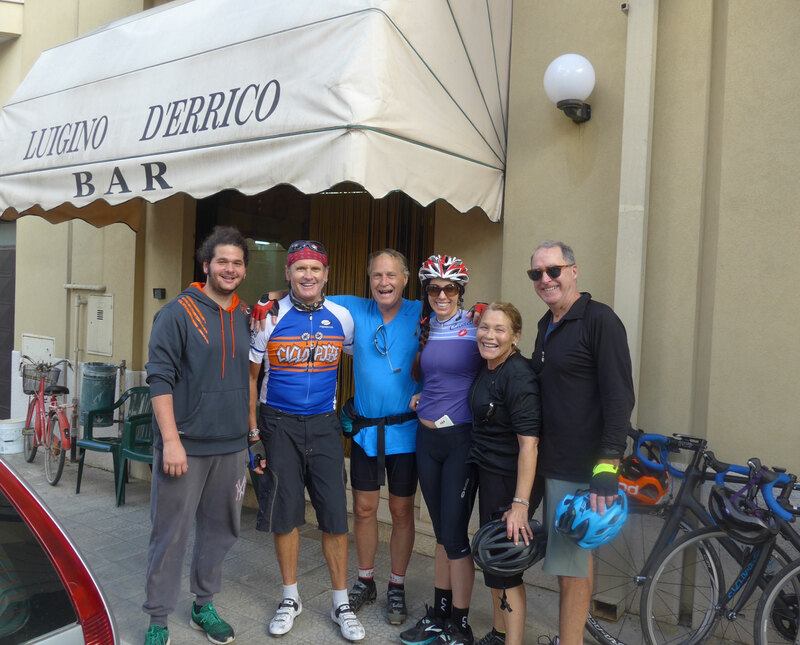 We dined at the same delicious restaurant Osteria del Tempo Perso. 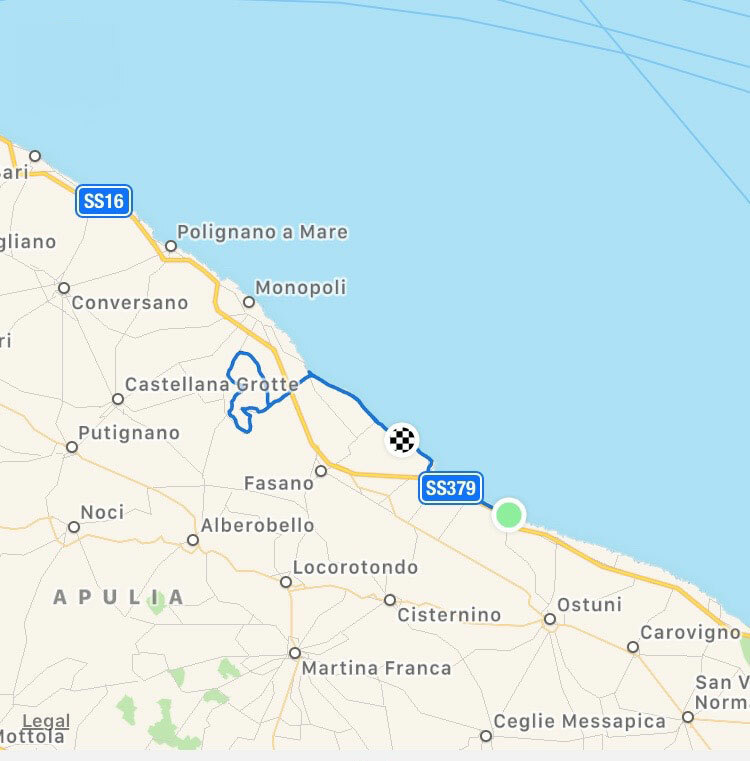 Today we skirted the ocean with its numerous beach clubs and miles of undeveloped beaches. 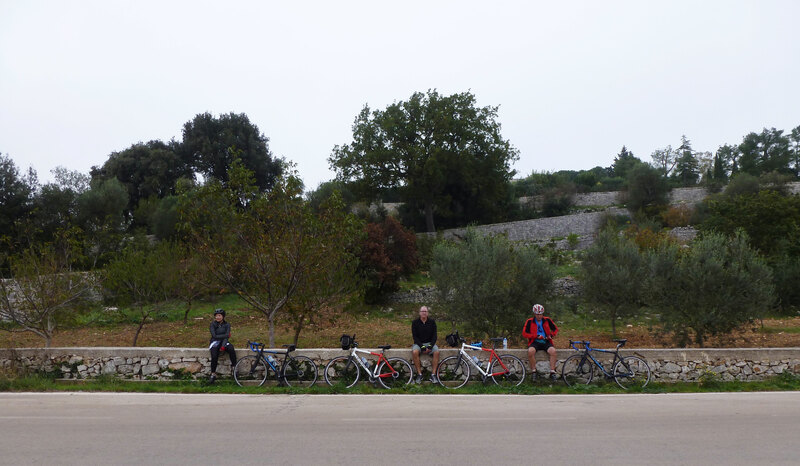 We stopped at another local coffee shop overlooking the Adriatic before doing a climb up to the mountains. 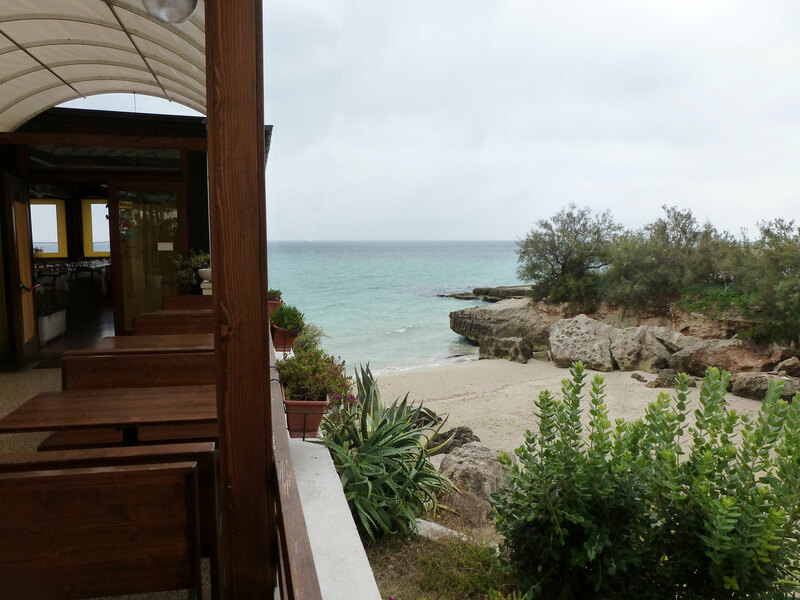 We ended the biking portion of the trip at a beachside restaurant. 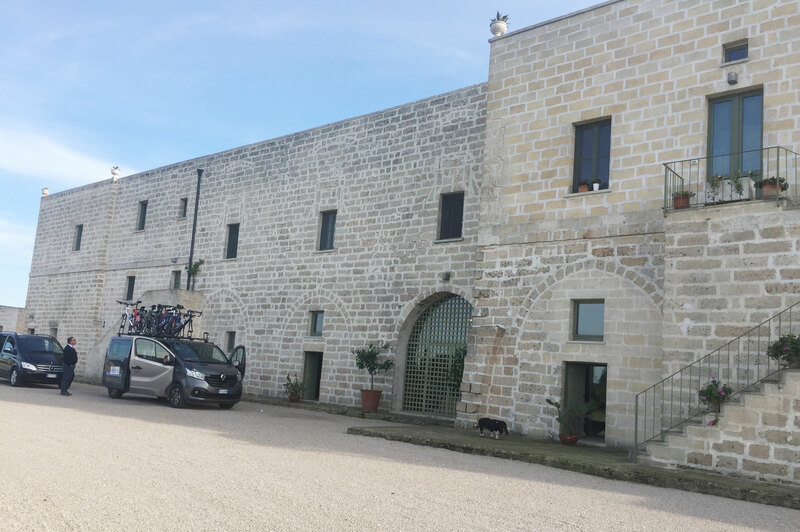 We enjoyed a fun and information wine tasting at the Masseria and followed by yet another wonderful dinner. 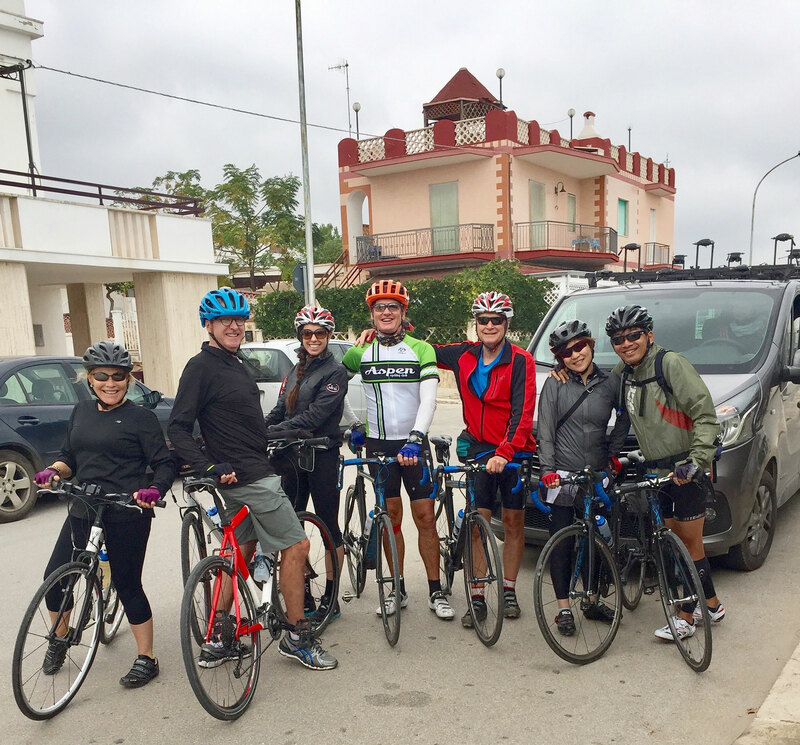 I can not say enough wonderful things about our biking tour with Cicloposse. For me it is very important to experience the local culuture. 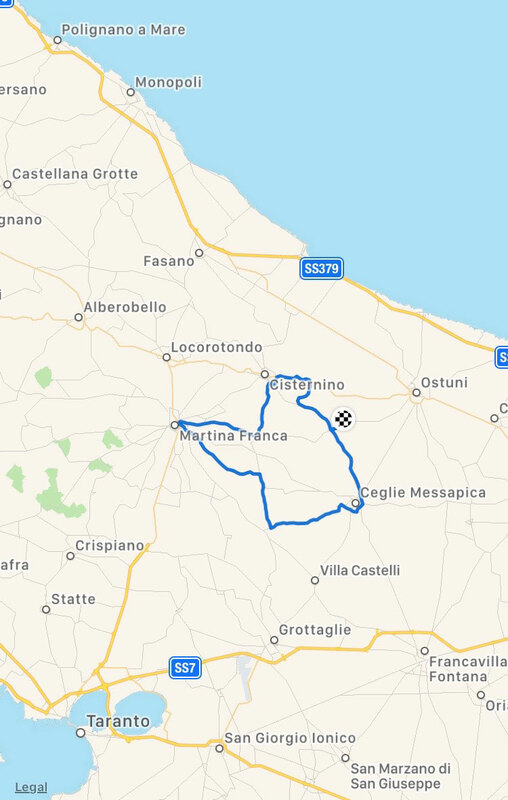 The places Marco chose were as local as it gets. Some of the coffee shops, cafes and bars I could not even find online. 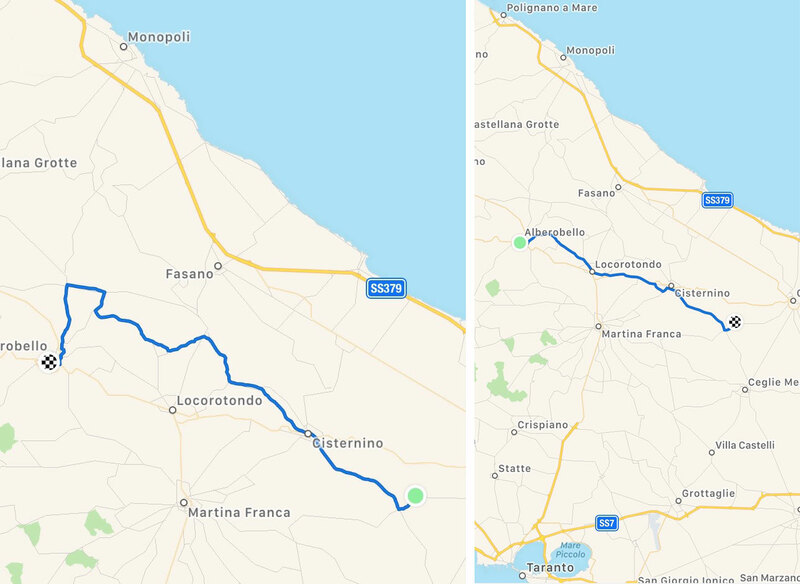 I felt like we got a true Italian experience. The bikes were top of the line. 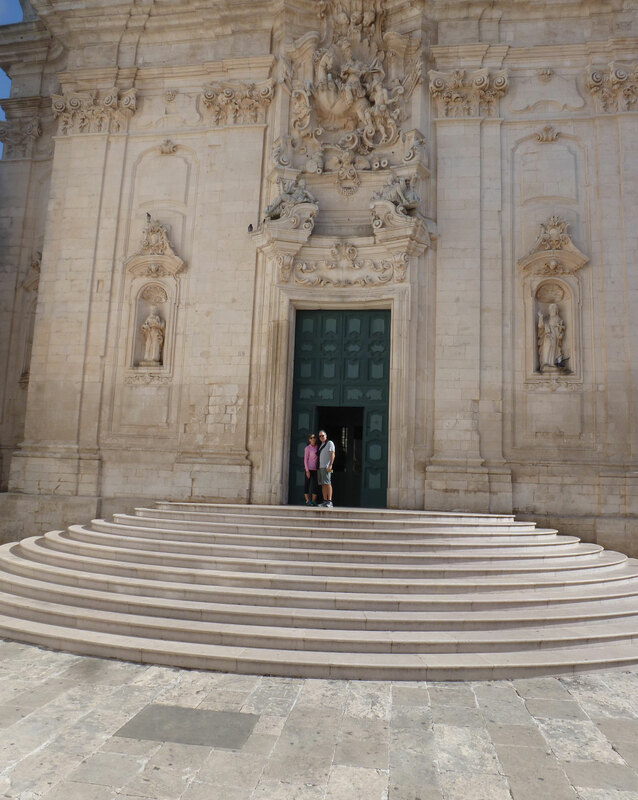 Marco and Tomaso were wonderful and always kept us laughing. 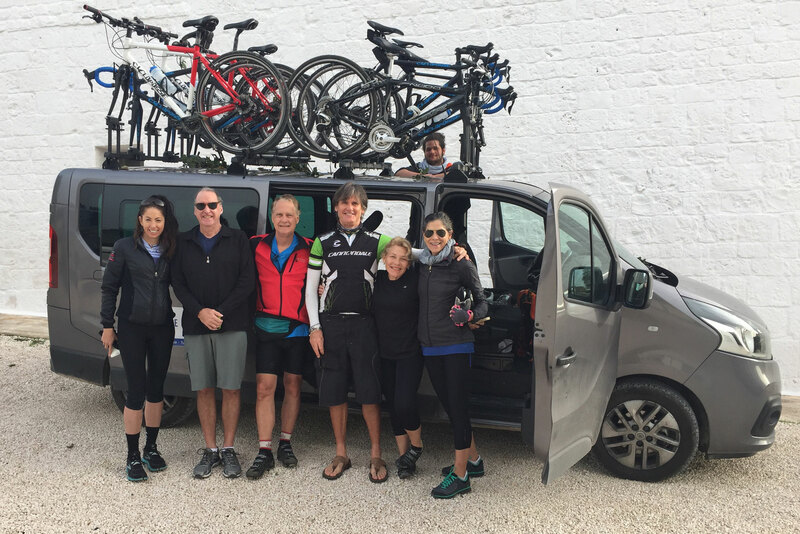 Julianna was behind the scenes and did everything to make our trip seamless and customized to our groups desires and abilities. We are already looking forward to our next adventure. 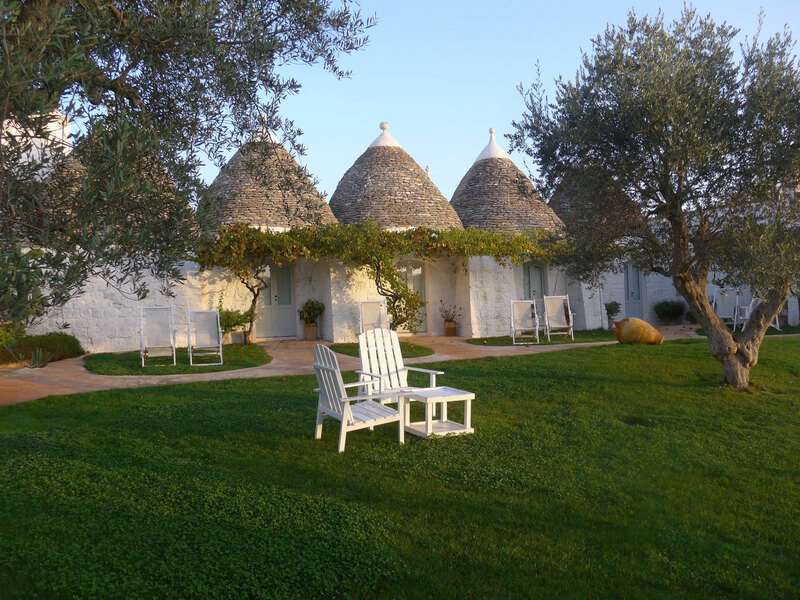 The masseria Cervarolo is a farm with trulli houses. 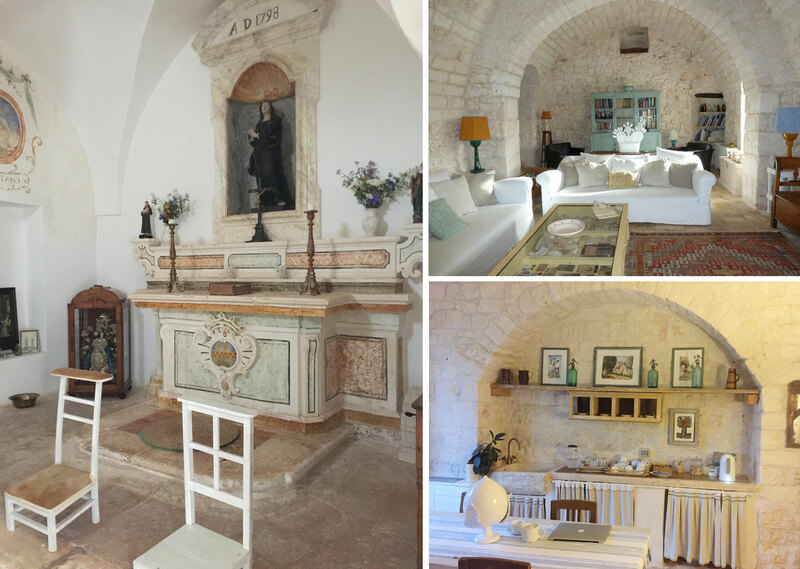 It was built in the XVI century, and has been restored over the past 5 years. 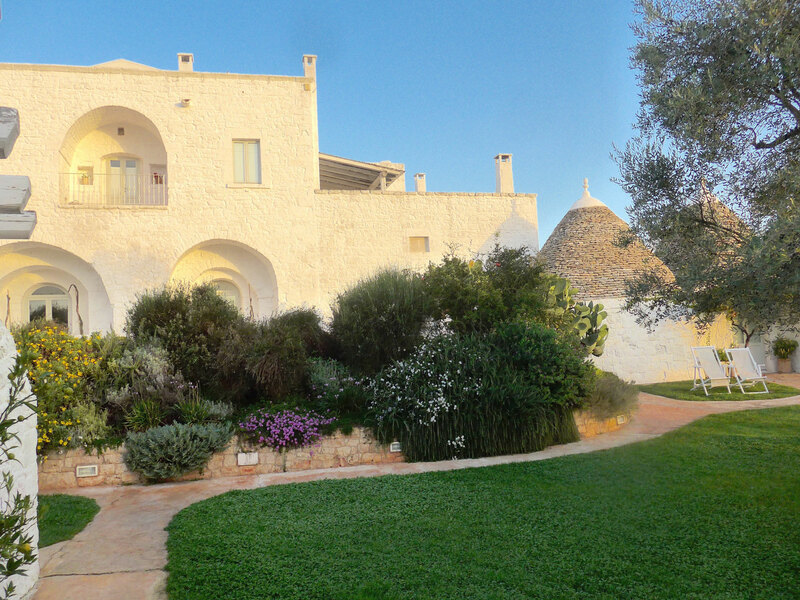 It is located just 6 km from Ostuni village. 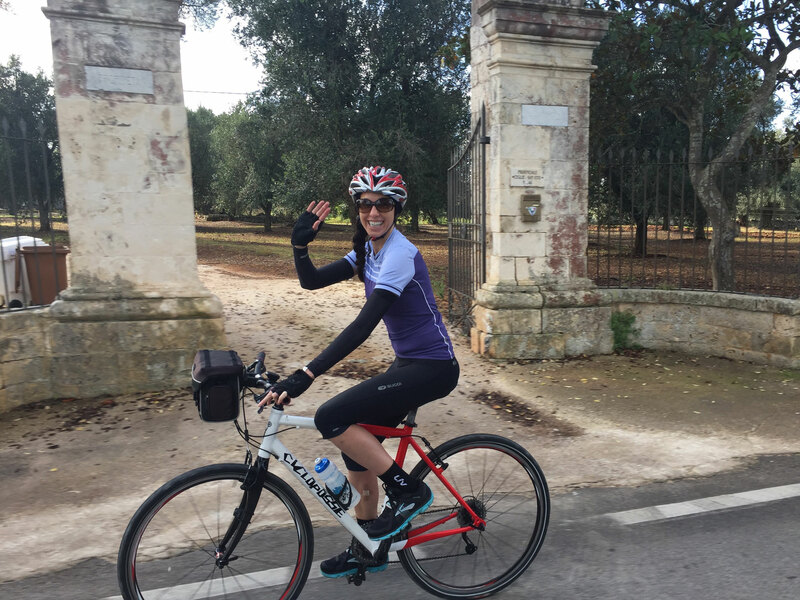 We called the Masseria home for 6 nights, while we explored Puglia by bike during the day. The owner Tio and the staff made us feel so welcome from the moment we arrived and they were waiting at the entrance. 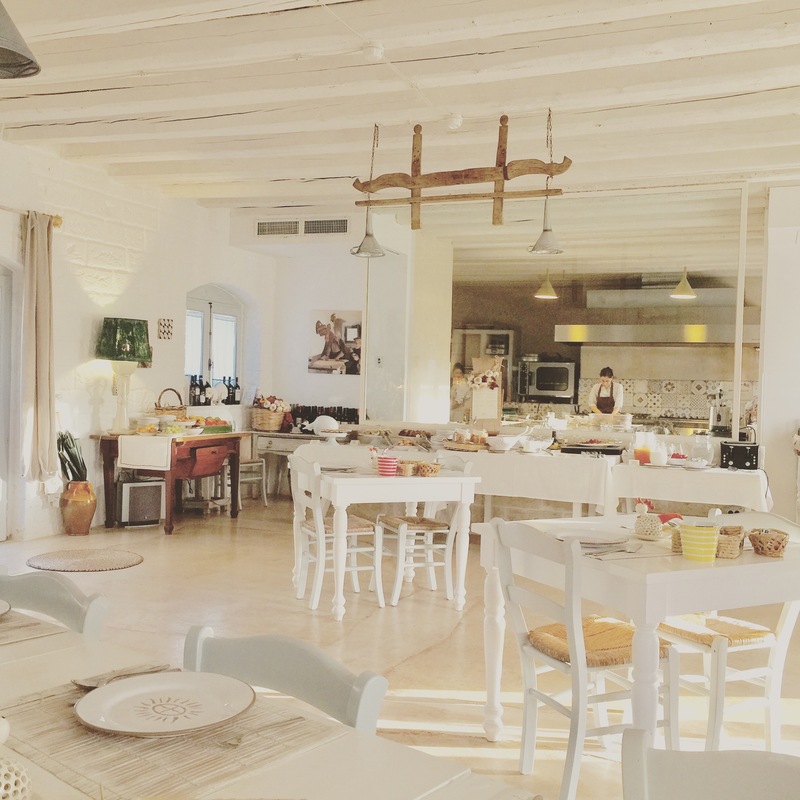 The most beautiful breakfast is served in the dining area. 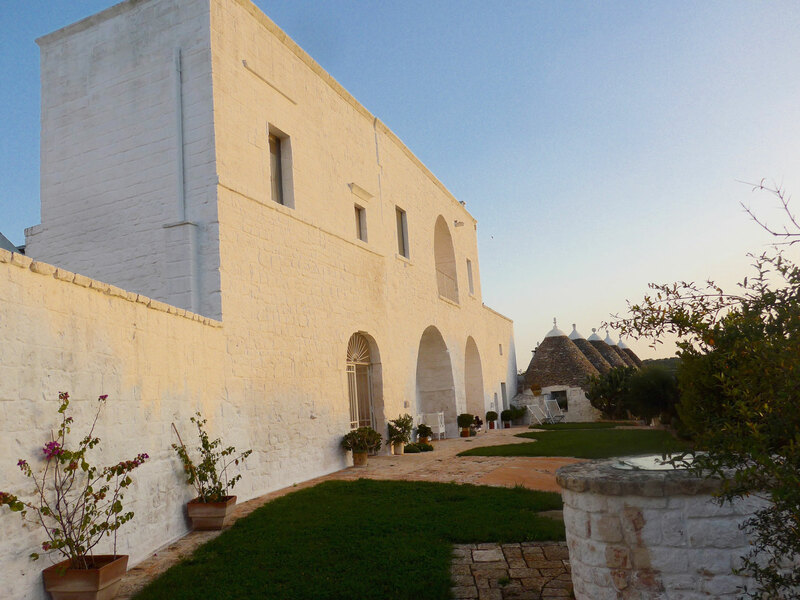 The library area in the main masseria serves as an evening cocktail area, where it is fun to meet other guests. In the comfort of the library area we had an educational wine tasting evening from a lovely, passionate young sommelier. 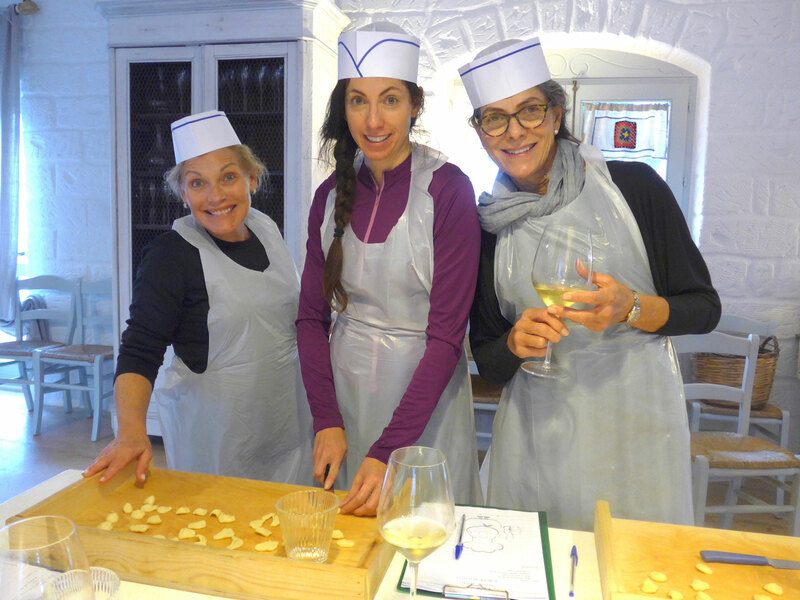 Late afternoon simple cooking classes are organized to show how to make the local specialties (orcchiette, focaccia, taralli, and biscotti). 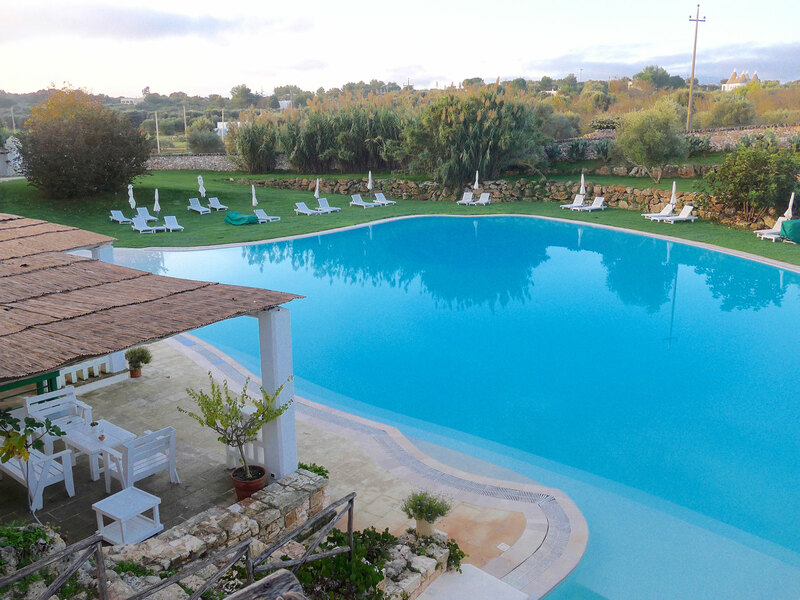 I dream (most comfortable bed with ironed sheets) of returning to this beautiful retreat. Its that time of the year again. Fall off season, which translates to: travel time. 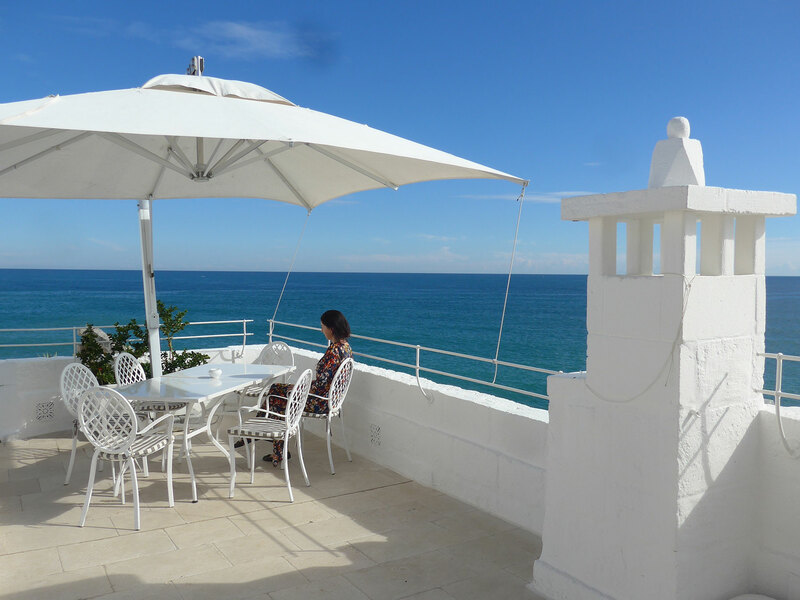 First stop is Don Ferrante Hotel perched on the rocks above the Adriatic Sea. 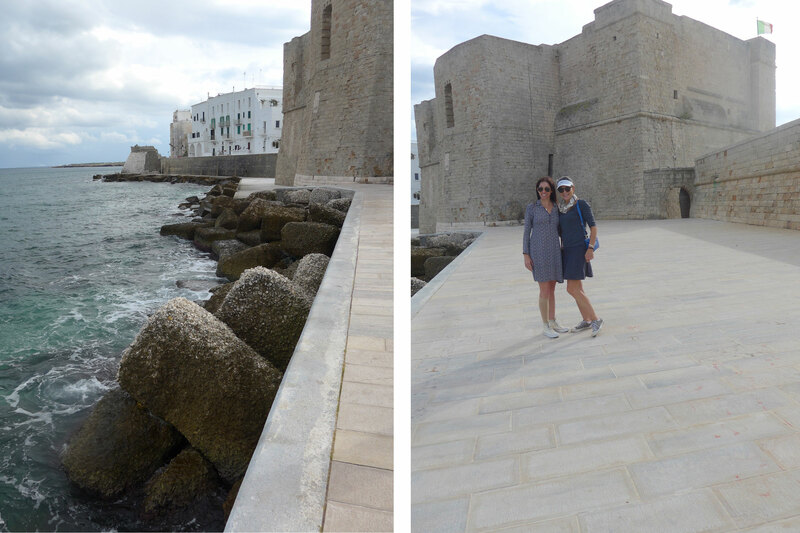 The tiny city of Monopoli is the heal of Italy’s boot is comprised of narrow white stone streets, large rock stone pavers, white ceramic pots laden with succulents, castles, cathedrals and the beautiful blue sea. 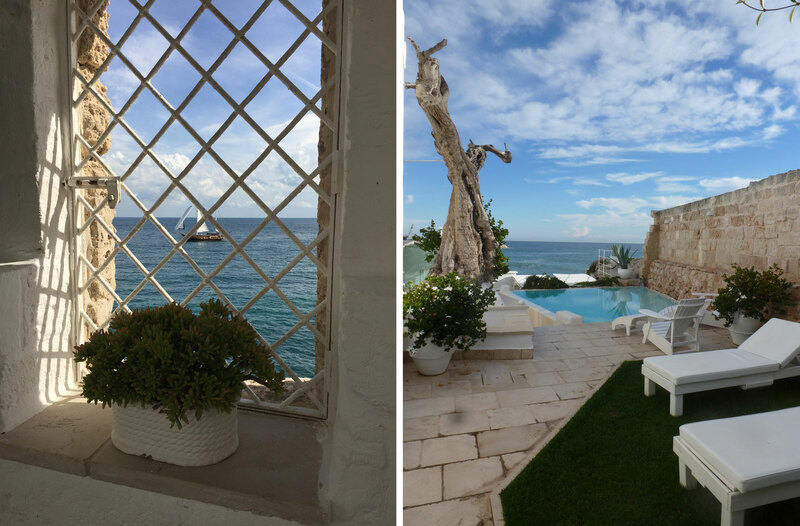 This tiny boutique hotel is beautiful and has the most stunning views of the Adriatic Sea. The staff is exceptionaly friendly and accomindating. The rooms are elegant down to the Frette ironed sheets. 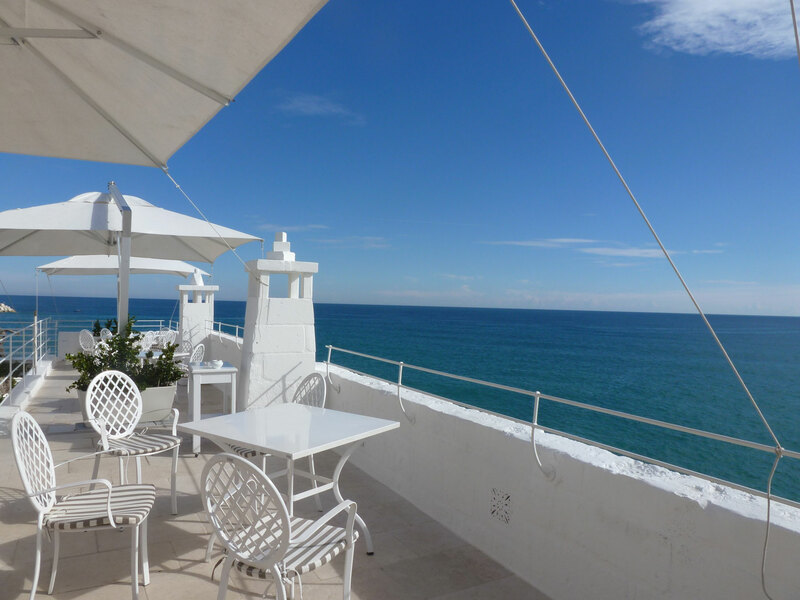 The breakfast is wonderful, try to get a table in the window perched above the sea. Persecco on the roof top terrace is a must. I loved everything about Don Ferante. 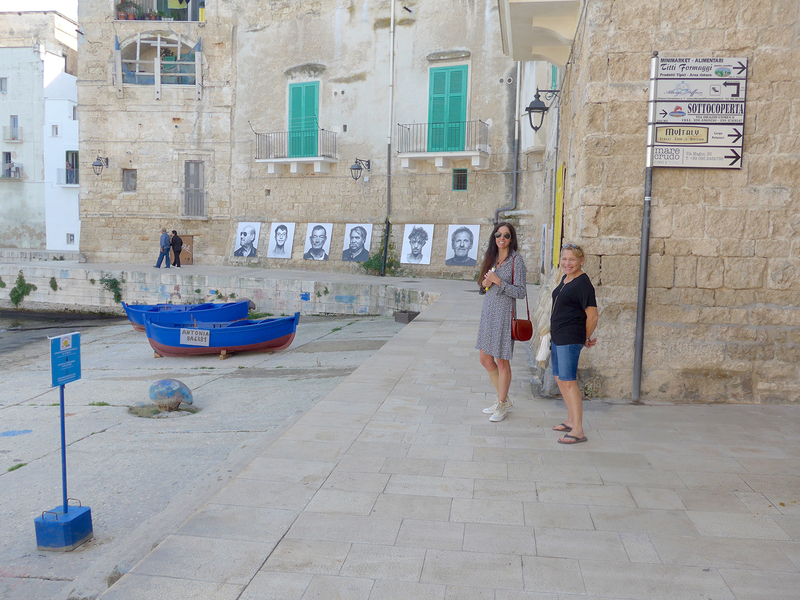 When in Monopoli eat the seafood. Throughout the day fishing boats come and go with the daily catch. You can watch the locals catch octopus with their hands. 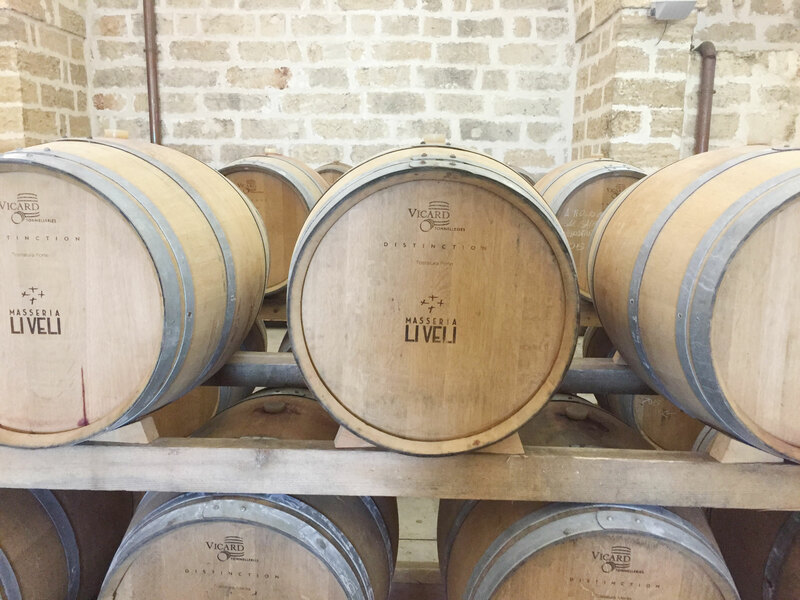 Puglia has many wines to offer and at incredibly reasonable prices. My preference is Primotivo. You will want to make reservations for dinner. 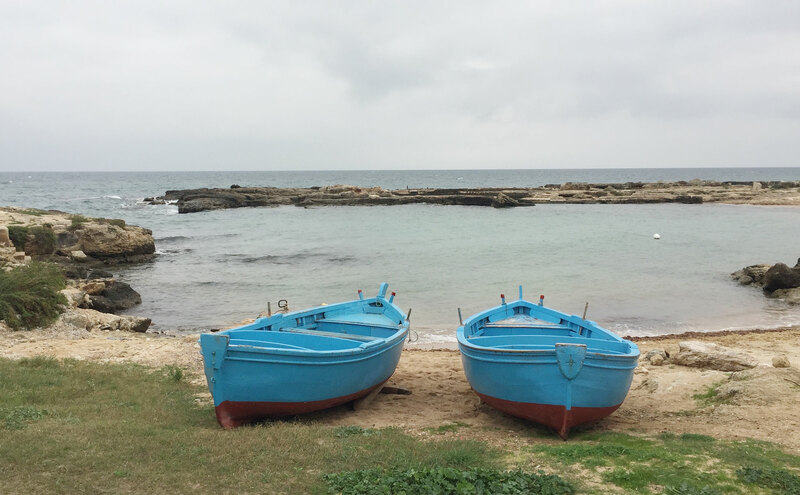 Puglia is known for its appetizers. Many times they will just be sent out without ordering them. Often times we found ourselves full before the main courses had arrived. 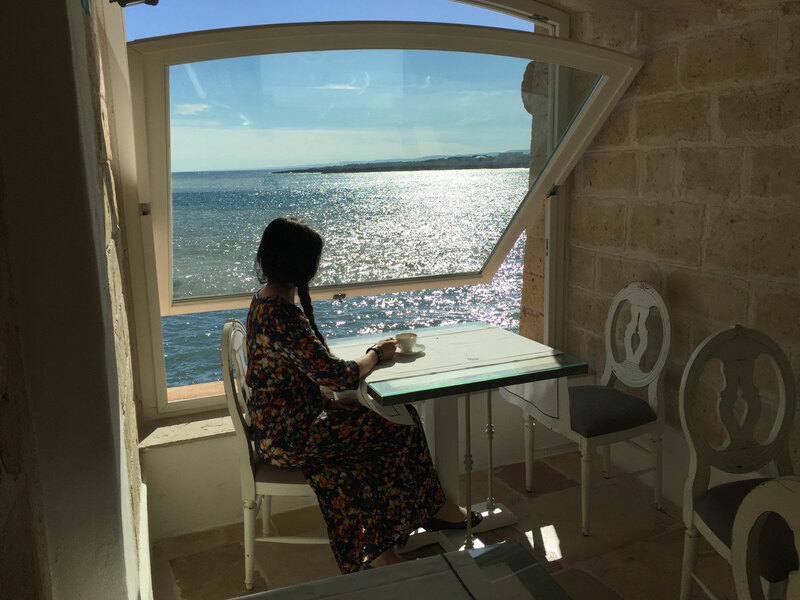 A personal diary of wanderlust by Maleka Vrana. © Maleka Designs + Maleka Vrana 2019. All rights reserved. Celebrate the details that make life sweet and beautiful. 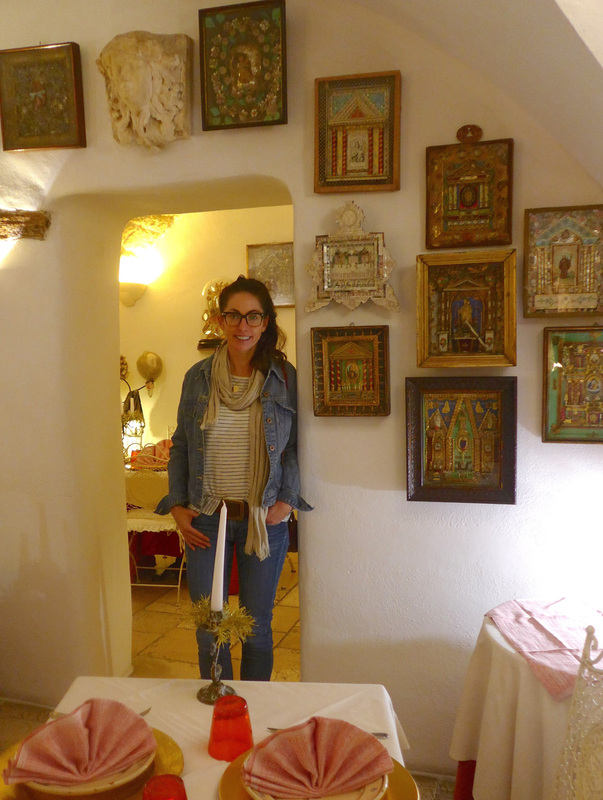 My blog is where I share bits and pieces of inspiration from my life and work in Aspen.